My mother’s dressing table, a lovely piece of mahogany with very feminine crystal lamps, a glass top, and a large wall mirror, was always crowded with family artifacts. Not only were there the silver-backed brush, comb, and hand mirror that had been her mother’s, but there were a silver pin tray, various crystal jars with silver tops, and photos of family members. 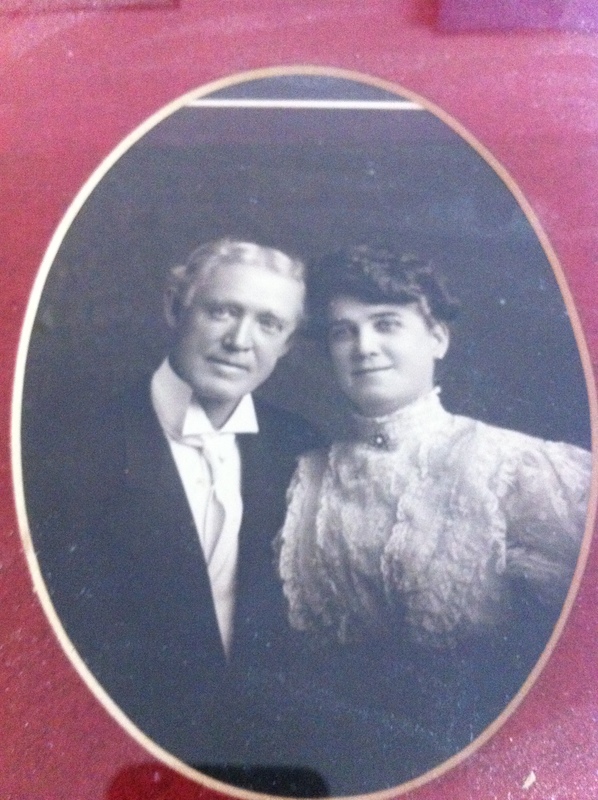 In the last year or two of her life, these included this studio shot of a handsome elderly couple. It hadn’t been up there all our lives, but Mom had rearranged photos as she pleased, and so here they were. We took them to be some relatives, possibly parents, of our grandfather, John A. Brown. This seemed likely because the man has a look of the Irish about him, and my grandfather, although born and raised in this country, was 100% of Irish blood. On the back of the frame was the date “7-27-05,” and as you can see, the style of dress certainly indicates 1905. Imagine my surprise when I found another formal photo of this same elderly man, this sleek silver fox kind of guy, with a dolled-up little girl. And another of the little girl, with the same matronly woman. Okay, I thought, more relatives. Then I looked at the dedication on back of each of these professionally shot and mounted photos. 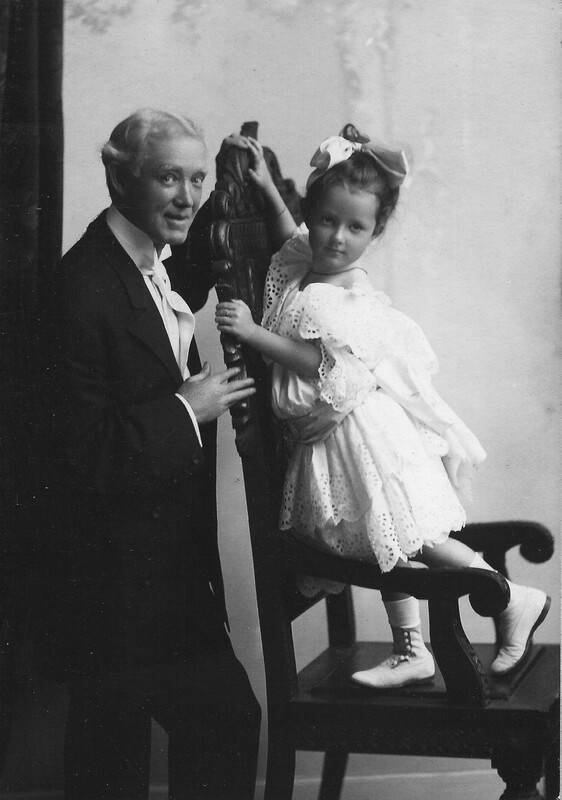 It identified the little girl as a daughter of George M. Cohan, and the older people as Jeremiah J. Cohan and his wife, George M.’s parents, who had been in show business all their lives and put little George into the act as a young boy. From which he rose to great fame and worldly success on Broadway. My grandfather came to know George M. Cohan in the course of doing some valuable legal work for him. Afterwards, they remained on friendly terms, friendly enough that George M. sent John A. Brown photos of his little girl and his parents in 1905. My grandfather knew many famous people, not that he bragged about it or dropped names. It’s a weird feeling when you realize that a relative had contact with important people, mingled with them, did business with them. I remember answering his office phone one summer during a visit when I was twelve, and taking a message from the Chicago district attorney. Boy, was I impressed. (I watched “Perry Mason” on TV, so I knew a DA was important.) My own life was in a quiet, safe social backwater. No one I ever met while growing up was famous or significant in history of any kind. Nobody I knew in my neighborhood growing up, nobody I met in elementary school or junior high or high school or even college has become famous, or contributed anything significant to any field of endeavor that I know of. Nobody. Not like George M. Cohan, the king of Broadway. But who was George M. Cohan, you ask? And who were Jeremiah Cohan and his wife? And why does the inscription on the back of the little girl’s photo call her “Georgia” when Wikipedia calls her Georgette? Sic transit gloria mundi. History. They’re all ancient history. But not, as it turns out, blood relatives. One thing I did before my mother’s memory slipped away was to go over a bunch of really old family photos with her and write down who the people were. I just hope my kids can read my writing! I discovered years ago that her “Grandma Fawtner” was actually spelled “Grandma Falconer.” It surprised the heck out of me, when I was a kid, to see that name written down, but I think it must be an almost medieval pronunciation of the word falconer. My kids may never know it was pronounced Fawtner because they never heard my mom say it.